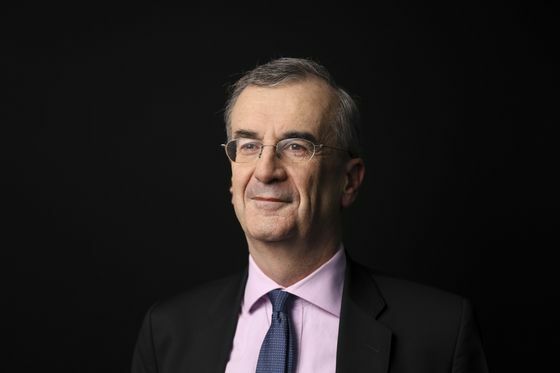 Francois Villeroy de Galhau has notched up an intellectual victory at the European Central Bank just when his credentials for higher office could do with being noticed. The Bank of France governor, a contender to replace President Mario Draghi, might claim to have won over colleagues with his push for a rethink of the institution’s negative interest rate policy. That ability to convince and lead opinion is conveniently on display just weeks before European Union governments are set to determine the succession. Draghi didn’t credit his French colleague with the idea when he announced that the ECB was considering a new approach to soften the impact of sub-zero borrowing costs on banks’ balance sheets. But the initiative follows a specific intervention by Villeroy at the Governing Council’s March 7 meeting, which then prompted officials to commission a study into the matter. A spokesman for the Bank of France declined to comment on Villeroy’s involvement in ECB policy. It’s relatively unusual for the arguments of a single central bank governor to sway ECB policy. Villeroy’s push may reflect calls from French banks for relief from the penalty of negative rates that their balance sheets have endured. That could become even harder for lenders to manage as the economy slows. “Negative interest rates, in an environment where you cannot pass through the negative rates to your customer, basically is a tax, which affects the profitability of banks,” Lorenzo Bini Smaghi, a former ECB Executive Board member who is now chairman of Societe Generale SA, said at a Bank of France conference on Friday. Speaking at the same conference, Villeroy said that years of experience of sub-zero rates have provided more evidence of their effects, and endorsed Draghi’s review of the matter. The policy has prompted intensifying criticism elsewhere recently, including a paper published in January, co-written by former U.S. Treasury Secretary Lawrence Summers, which said that it risked being “contractionary” because of the harm to bank profits. It also isn’t yet certain that the pleas of Villeroy will be met. ECB Chief Economist Peter Praet said in an interview that there needs to be a solid monetary-policy case before officials act to mitigate the side effects on banks. The Bank of France governor, a former chief operating officer of BNP Paribas SA, isn’t the only candidate to have touted new ideas just as the Draghi era nears its end. One of his rivals, Bank of Finland Governor Olli Rehn, has highlighted the need for a revamp of the ECB’s policy framework, though with limited traction so far. Another contender for Draghi’s crown, Bundesbank President Jens Weidmann, has struggled to persuade colleagues over many years, most notably as the ECB pursued quantitative easing that he felt was unnecessary. European leaders will pick the next ECB chief as part of a haggling process over a number of senior positions including the presidents of the Commission and the Council. 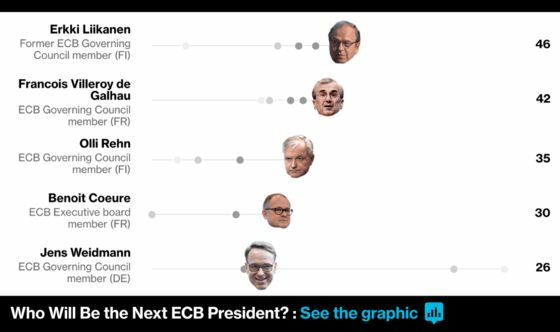 Villeroy, Executive Board member Benoit Coeure, Weidmann, Rehn, and Rehn’s predecessor, Erkki Liikanen, are all in the running to replace Draghi. The choice is likely to happen some time after the European Parliament elections in late May, and may be driven by nationality rather than other considerations. Rehn called this week for leaders to use the basis of “merit” in their selection, and while that’s always been a subsidiary concern, it remains valid. The three presidents of the ECB so far have all tended to be well respected by peers. However persuasive Villeroy’s ideas may be, that might become irrelevant to the contest if French President Emmanuel Macron decides to push for one of his nationals to get the presidency of the Commission instead. The head of state has yet to disclose his intentions.